It’s not an exaggeration to say that proper core training during and after pregnancy is the most significant thing you can do to improve your own health, and the health of your growing baby. However, the keyword here is “proper.” There is definitely a right and wrong way to go about this. Proper training can help prevent pregnancy pains and injuries (especially diastasis recti), improve your ability to push, enhance your immunity and digestion, reduce stress, expedite your postpartum recovery, and even create a healthier growth environment for your baby. So let’s start here by explaining the key muscles to focus on and the #1 most IMPORTANT core training technique to master first. The “Core Canister” is a term we use to refer to the deep core muscles of your diaphragm, transverse abdominis, and pelvic floor. As shown below, these muscles form the shape of a canister at the center of the body. Each Core Canister component plays an important role on its own, but it’s in working together as a unit that you see the greatest benefit. Let’s briefly discuss each component first. Diaphragm (DF): This is your body’s primary respiratory muscle, and breathing is your body’s “master regulator.” Proper diaphragmatic breathing improves focus, reduces stress, enhances immunity, helps digestion, and even delivers increased oxygen and nutrients to your growing baby. 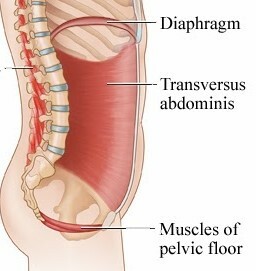 Transverse Abdominis (TVA): This is your body’s “inner girdle.” It’s your largest and innermost abdominal muscle, responsible for “holding everything in.” During pregnancy, a strong TVA helps prevent lower back pain and diastasis recti. It is also the muscle you’ll use to help push your baby out. Pelvic Floor (PF): This is a series of muscles that form a sling at the bottom of your core, often referred to as the “floor of the core.” Your PF muscles support your pelvic organs (including your uterus, which grows to about 500 times its original size during pregnancy! ), control continence, stabilize your pelvic region, aid proper sexual response, and assist in guiding your baby out during delivery. Building a strong core starts with properly activating your Core Canister, so the #1 most important move to master before anything else is a technique we call 360° Breathing. While it may seem simple, breathing in this manner activates ALL the muscles of the Core Canister. Therefore, if you can incorporate this style of breathing into your movements as you exercise, you will dramatically improve the effectiveness of every move you perform, and improve your core strength with each breath you take. Watch this video to learn how to perform 360° Breathing, and how to incorporate it into your movements. Practice 360° Breathing as much as you can — sitting at your desk, watching TV, lying in bed, etc. The more you practice it, the more natural it will become. And if you can train yourself to naturally breathe this way, that’s over 20,000 reps of great core work every day! Now that we’ve laid the foundation, check out this piece on the Best Prenatal Core Exercises, as well as What to Avoid.